Gavin is determined to grow a giant pumpkin and win first prize at the fair! Before he can enter his gourd in the contest, Gavin must first learn how to plant, fertilize, and pollinate the pumpkin seeds. With the help of his family and his neighbors, Gavin watches the seasons pass and his small pumpkin grow bigger and bigger. Perfect for the classroom, the book teaches about the science of gardening. Kids will learn about planting a seed, hand-pollination, protecting plants from frost, and choosing one pumpkin to fertilize so that it will grow to be huge! From planting to pruning to pumpkin pie, this delightful story shows how to cultivate a garden. 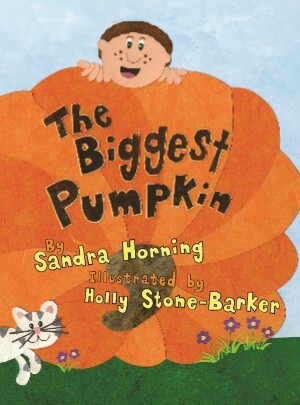 Sandra Horning creates an educational and amusing story that emphasizes the importance of science in gardening. The colorful harvest illustrations were created through a cut-paper collage technique, a specialty of illustrator Holly Stone-Barker. The method adds aspect, quality, and life to the two-dimensional pages. With the advice and help from friends and a big truck, you too can grow a prize-winning pumpkin for your town fair! Sandra Horning graduated from Bryn Mawr College with a BA in Sociology and a minor in Russian. Horning’s love of children’s books began in school, flourished when she worked in the children’s department of a bookstore, and took shape as a career when she lived in County Galway, Ireland. She lives with her husband, two sons, eight chickens, and three ducks in Chaplin, Connecticut. Illustrator Holly Stone-Barker graduated with a BFA in communications design from Pratt Institute in New York. She works as a freelance illustrator and enjoys teaching. Stone-Barker’s colorful illustrations are created with a variety of different papers that she finds in her travels. Some of her other titles with Pelican include Blue Frog: The Legend of Chocolate and The Little “Read” Hen. She lives in Baton Rouge, Louisiana, with her husband and two children. Click here for sample pages. Click here for the activity guide for The Biggest Pumpkin.